I recently added the Google search applet on the left column of the blog. For those of you who haven't try it, you can search any recipes or themes that I posted since December 2008 and also, you can search recipes from Montreal Food Bloggers. Give it a try! While searching through my blog, I noticed that I only have one cookie recipe : Coconut Macaroons. I shall add more cookie recipes in the future. 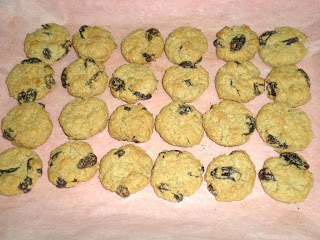 I try out the oatmeal raisin cookies recipe by Two Peas in Their Pod, and it turns out pretty good and chewy. Somehow, my cookies ended up to be small compared to the original recipe. I think it has to do with the choice of oats. 2. In a small bowl, cover raisins with water for 5 mins. 3. In a large bowl, mix together margarine, brown sugar, egg and vanilla extract. In another bowl, combine flour, baking soda, cinnamon, salt. 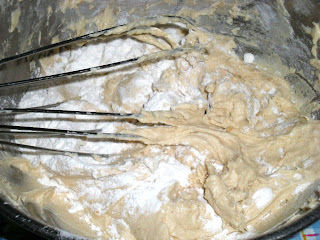 Gradually add the dry ingredients to the creamy mixture. Blend until combined. 4. 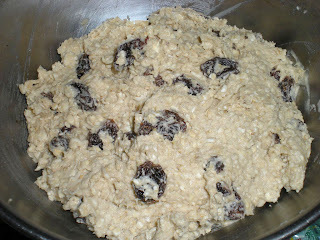 Fold in the quick oats and raisins. 5. Optional : Refrigerate the dough for at least 30 mins. 6. Line a parchment on a cookie sheet. 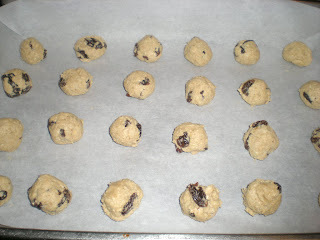 Scoop a tablespoonful of the dough and transfer it onto the cookie sheet. 7. Bake for 10-15 mins until golden. Let it cool. Oh yeah, these would definitely hit the spot right now! Great recipe. It is hard to resist a good oatmeal and raisin cookie.